Traditional choker necklace with kundan polki and pearl for every occasion. 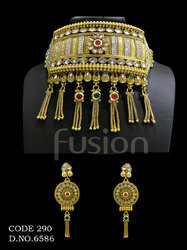 We are engaged in offering Antique Choker Necklace. Banking on our enriched industry experience, we are able to supply Antique Chokers Necklace. Our company has been successful in winning appreciation from the clients as one of the most prominent names in the trading of Antique Choker Necklace. Antique choker necklace decorated with gold beads and precious gems on intricately designed embossed gold leaves. 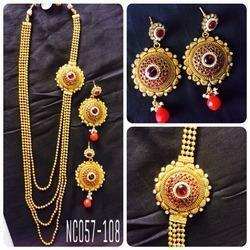 Our reputed entity is engaged in supplying Antique Choker Necklace.